Newly developed Tuning-fork Vibration Method* promises you high accuracy and wide measurement range without replacing sensor plates!! *Patent pending. 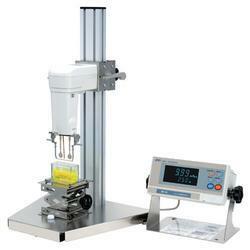 Sine-wave Vibro Viscometer SV-10/SV-100 measures viscosity by detecting the driving electric current necessary to resonate the two sensor plates at constant frequency of 30Hz and amplitude of less than 1mm. Tuning-fork Vibration Method turns into reality for excellent repeatability of 1% of reading for viscosity measurement by Sine-wave Vibro Viscometer SV-10 / SV-100. The sensor plate for the SV series is of a thin and small size, in area and in mass, making it is less influenced by the temperature change of the sample fluid and as a result the viscosity measurement tracks the change of viscosity of sample fluid. It is very important to measure the temperature of the fluid correctly because the viscosity is very much dependent upon the temperature of the fluid. SV series can detect accurate temperature immediately because the fluid and the detection unit (sensor plates) with small surface area/thermal capacity reach the thermal equilibrium in only a few seconds. 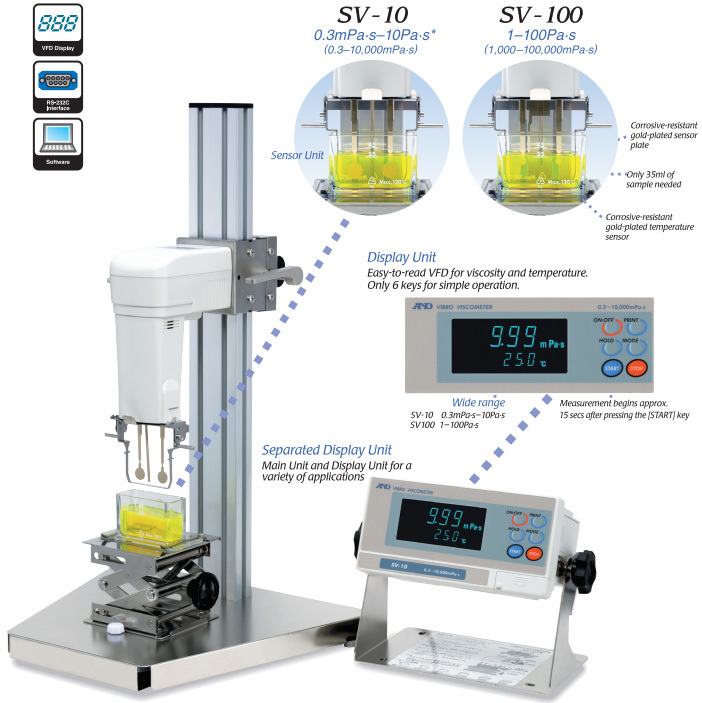 SV series, Tuning-fork Vibration Method does not cause damage to the sample fluid and allows measurement of cloud point of samples such as surface active agents and of surface/interface changes such as wettability because of its excellent feature for wide measurement range without the need to replace the sensor plates. SV series is composed of the Display Unit and Main Unit offering excellent placement flexibility. Due to the simple structure, the SUS 304 Stainless steel sensor plates and temperature sensor (all gold plated) and SUS 304 stainless steel protector can be easily and quickly cleaned. WinCT-Viscosity (RsVisco) is software to import the measured data of viscosity and temperature to a PC and display graphically the changes in real-time for your analysis.